Blue Mars Blog: Blue Friday Shopping Deals in Blue Mars! It is Blue Friday in Blue Mars! Time to shop til you drop and get great deals on awesome merchandise from your favourite designers! These deals are available on Friday November 26, 2010 only! Don’t miss your opportunity! Stop by Zuma in Misty Hollow for a great deal on cute sweaters to keep you warm on those cold winter nights! 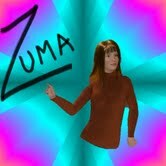 Both the teal and rust color of the Zuma WinterWear sweater have been discounted from 350BLU$ to only 50BLU$! Available on Blue Friday only! Fix up your avatar with a new skin from Adam and Eve in Caledonia! Usually 1000BLU$, these gorgeous skins can be yours on Blue Friday for only 250BLU$! Adam and Eve are also discounting their Drumalis sport shirts in Black and Red, which are on sale this Friday for only 100BLU$, down from their usual price of 500BLU$! Blue Friday Exclusive! 8502.Bauhaus has a line of adorable mini tops in their GridRock City Shop. Get the black mini top for only 99BLU$! Price and color available on Blue Friday only! Get half off select items in Tharsis! At least one item in each department of the Tirion Designs store will be discounted 50%! The item specifics are being kept a secret, so the bargains will only be available to the truly worthy bargain hunters who can find them! Be sure to check out all of our great Harvest Homecoming events going on this weekend, including our BLU$ sign up bonuses for new members and members who help us spread the word! Learn more here.